An Appreciation Of The Pope’s Encyclical Letter On The Environment | Small Farmers. Big Change. There’s excitement here at Equal Exchange about Pope Francis’ encyclical letter on the environment, “Laudato Si’ (Praise Be): Care for our Common Home.” In the Pope’s encyclical, he makes a powerful call for urgent action on climate change and environmental pollution. These issues are of paramount importance to many, including us at Equal Exchange. A central theme of the Pope’s encyclical is that there can be no solution to the climate crisis without redressing the gross disparities of wealth between the global north and the impoverished global south, and bringing real, sustainable economic progress to the developing world. The problem, he says, is not just one of education or resources, but of unequal power relationships between the north and south, the wealthy and the poor, and the disproportionate effect of pollution and climate change on the most vulnerable communities. As a Fair Trade organization, these issues are ones we know well, and challenging this inequality is at the heart of our mission. In the first chapter, Pope Francis discusses pollution, climate change, water, and the decline of biodiversity. He emphasizes the ways in which the poor, individually and as nations, bear the brunt of environmental degradation and climate change. These problems are worsened by the reckless business practices of “companies which operate in less-developed countries in ways they could never do at home.” When such companies close down their mines, factories or plantations, “they leave behind great human and environmental liabilities” like unemployment, deforestation, open pits and polluted rivers. In illustrating an alternative, the Pope highlights communities of small farmers, like those who partner with Catholic Relief Services (CRS) and Equal Exchange. He describes them as “co-operatives of small producers [who] adopt less polluting means of production, and opt for a non-consumerist model of life, recreation and community.” We were thrilled to see the Pope recognize and promote the importance of small farmer co-ops and their role in driving forward a more sustainable farming model. Equal Exchange and our interfaith partners have had close relationships with such communities for decades, and we strive to champion and support them in all we do. For example, Catholic Relief Services has helped farming communities develop organic coffee farming and processing systems, among many other projects. Equal Exchange has consistently offered a premium price to communities which produce their coffee organically and helped encourage organic innovation wherever possible. 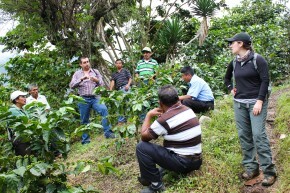 Recently, both Equal Exchange and CRS have worked to support efforts to implement organic solutions to the one of the most pressing environmental issues in Latin America: coffee rust fungus, a widespread and devastating crop disease exacerbated by climate change. Finding access to the market as a small farmer is a serious challenge, and historically it has not favored the farmer. Trading with small producer co-ops and giving them market access, without middlemen or exploitation, is a central tenet of Fair Trade. Co-ops also allow farmers to pool resources to build up the essential “infrastructure of sales and transport,” supported by Fair Traders like Equal Exchange and development organizations like Catholic Relief Services. Pope Francis has written a profound, rich document that warrants several careful readings. Read more here.